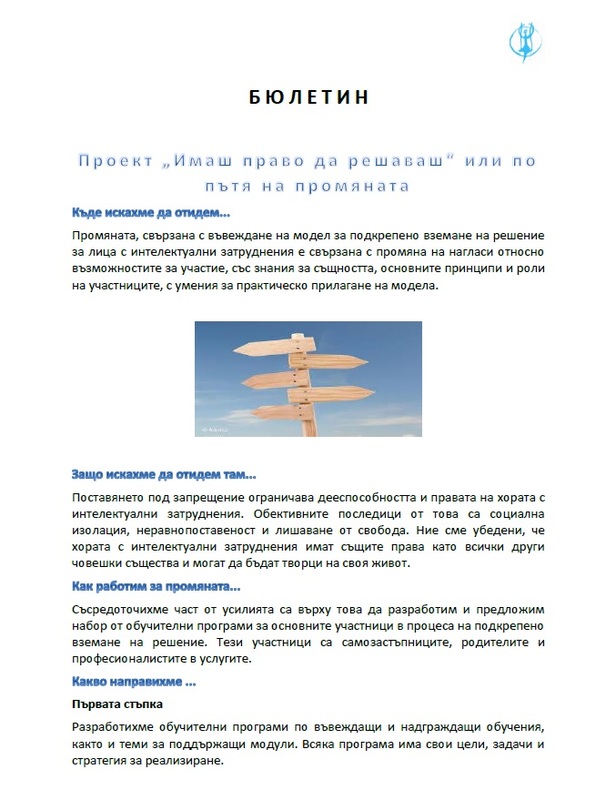 Association “Choise” – Bansko, nongovernmental support and advocacy organization on the area of municipality of Bansko. It is established in 1997 of the parents of children with disabilities. NGO “Innovation” has been registered on 03. 12. 2009 as a legal non-profit entity to realize public benefit services . Manager of the Association – Borislav Stamboliiski. • Development of Social Services Accommodation center for families (ACF) and the Center for Social Rehabilitation and Integration (CSRI) in Bobov Dol. NGO “Innovation” provides social services of residential and community type of services based in the territory of Bobov Dol – Accommodation center for families (ACF) and the Center for Social Rehabilitation and integration (CSRI). In the Center for Social Rehabilitation and Integration – Bobov Dol works multidisciplinary team consisting of the following experts: Manager, Team Leader, two speech and language therapists, two psychologists, two physical therapists, three occupation therapists. Every user has a specialized assessment and prepared individual plan, depending on the health and individual needs of each user. The purpose is a complex effect, leading to the restoration and development of the person with disability. Accommodation center for families is to provide close-to-family environment for the target group of 20 people with intellectual disabilities. Multidisciplinary team consisting of a manager, team leader, nurse and assistant instructors provides 24 – hour customer care. The center has got very good facilities, divided into 2 buildings, equipped with functional furnishings and excellent living conditions. Users of this service using single or double rooms, modern kitchens, dining rooms and living rooms. Available to consumers and spacious courtyard, suitable for walking and recreation. Users of ACF use the services of specialists in the CSRI. Association “St. 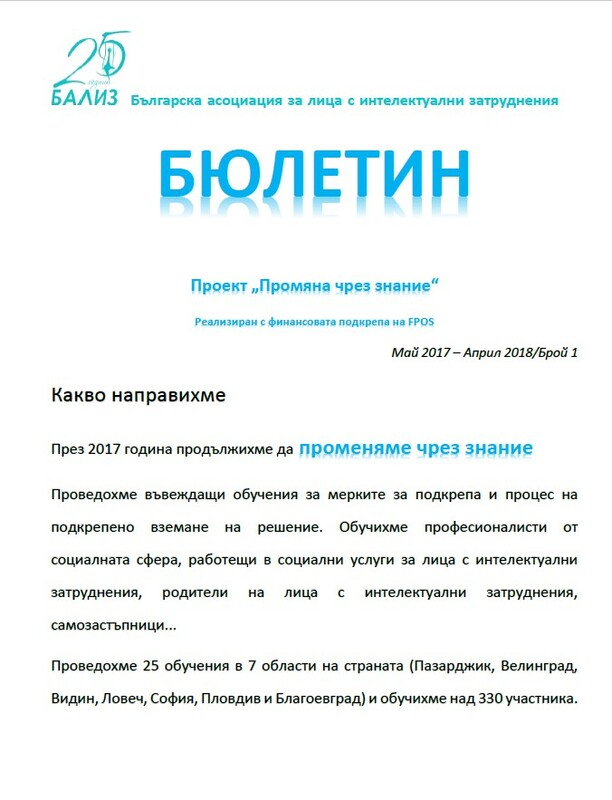 Ivan Rilski” – Burgas is established in 1994, as a branch office of the National association for supporting persons with intellectual disabilities. Since 2002 it is independent non-profit association. Slaveikov complex, Block 55, Antr. U, 6 fl. Ekzarh Iosif I 3 Sq. The “Family Center Maria” association was established as a parents’ organization – an assignee of the “Family Center Chaika” association, Varna. The intentions of the managing body are: recognition of the parental community and activation of the role of all the interested parties in the process of changing the model of social support for people in risk and integration of young families for social inclusion. The organization is licensed by the Social Support Agency and the State Agency for Child Protection to provide social services. Our mission: to create a modern social network which will work for improvement of quality of living for the families and children, family support, right protection activities and provision of direct social services. Association “Victoria – 04” – Veliko Tarnovo works to increase the quality of life of the children in Veliko Tarnovo municipality. Also it informs and increases the sensibility of the publuc to the problems of children and their parents. Regional association for supporting persons with mental disabilities – Vidin is a branch office of BAPID. It is established in 1989 of the parents of children with intellectual disabilities, and it is self-governing, nonpolitical organization. The Association works for well-being of the people with intellectual disabilities, supports their integration and social adaptation, stimulates applying of the high diagnostic standard, health and hiring people with intellectual disabilities. Association “Zornitsa” is a nonprofit association with social benefit to supporting persons with intellectual disabilities. It works for social integration and adaptation, staff-trainings and trainings for parents. Association “Future and protection of the persons with intellectual disabilities” – Gabrovo is established in 2003 as an nonprofit organization for supporting and creating optimum of life of the persons with intellectual disabilities and their families – creating the conditions for their social integration. Also it works for changing the social treatment of the people with intellectual disabilities. b.c. Druzhba, block 12, Antr. G, 6 fl., 16 app. Association “Perperikon – Kardzali” – Kardzali. The association is established in 2003, and it realizes the projects which aim is increasing the life standard, psychological and physical development of the persons with intellectual disabilities and their social integration. block Tolstoi 5, Ant. V, 27 app. Association “Protection” – Lovech is established in 1999 and it works on programs, which increase the quality of life of the persons with intellectual disabilities and their social integration. It develops network of services – social and life trainings, art-therapy, rehabilitation, labor-therapy, trainings for parents and specialists how to work with persons with intellectual disabilities. Association “Egida” – Pazardzik is volunteer, autonomy organization, which supports persons with intellectual and physical disabilities. It is independent, nongovernmental and non-profit organization. It unites parents, relatives and friends of the persons with disabilities and the specialists who work on the problems of the persons with disabilities. 23 Tsar Boris III Str. BAPID – Pleven is a non-profit association for social integration and adaptation of the children and the young people with physical and intellectual disabilities. 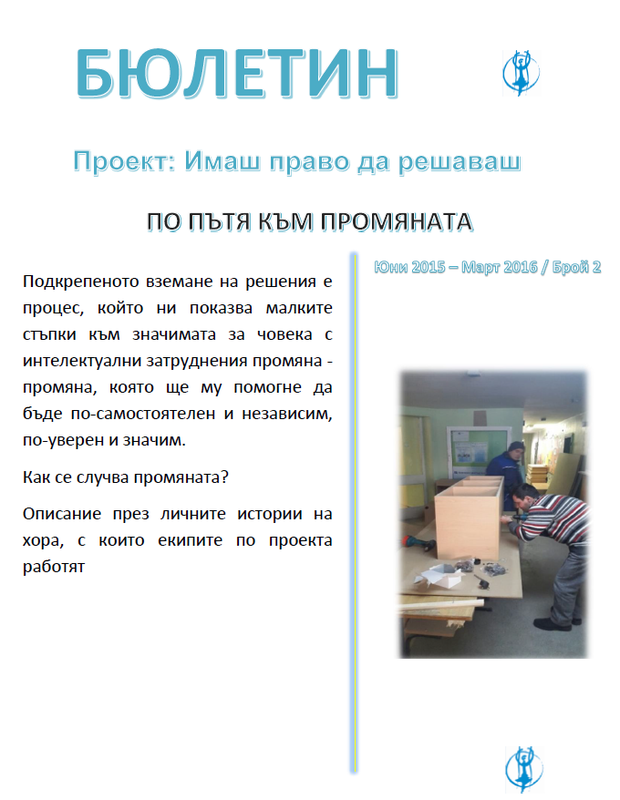 It provides information and services; supports creating of the support environment to the children and young people with disabilities and their families, who live in the town of Pleven and its area. Association “Parallel world” – Plovdiv is a parents’ non-profit organization, which informs about legal guarantees of the rights of the persons with disabilities and their families, assists for increasing the knowledge of parents of children with disabilities in connection with different forms of support, conducts initiatives for encouragement communication between people with disabilities and all the others. Ruse Association of Persons with Intellectual Disabilities – BAPID is an NGO registered in 2000 under the Law on Non-Profit Legal Entities which operates for public benefit.RALIZ works for life of dignity and independence of persons with intellectual disabilities and their families. RALIZ advocates for conducting a local and a national policy of respecting the rights of persons with intellectual problems and insists on the participation of persons with intellectual problems and their families in the outlining, monitoring and control of these policies. RALIZ helps build a supportive environment for its members – people with intellectual disabilities and their families, and their full integration into society. RALIZ supports the identifying and development of community-based social services, early intervention, integrated training and supported employment. RALIZ is a non-profit organization, recognizable (well-known), transparent, with good public image, an organizationally sustainable association whose members are persons with intellectual disabilities, their families and people and organizations sharing our mission and objectives. The Association works in the field of social work at a regional level, it successfully defends the rights of persons with disabilities, their right to dignified and independent life in the community. whose members are parents of disabled persons, persons with disabilities,specialists and adherents. A Certificate for providing social services – a Day Center for children and young people with mental handicaps, an adult day center, sheltered housing; a Center for social rehabilitation and integration, a social and personal assistant. Association “Hope for better future”- Silistra provides social services for the children and adults with disabilities. Association of the parents of the children with physical and mental disabilities “Future – 2000” – Sopot, works for improving life conditions of the persons with intellectual disabilities and physical disabilities which made a difference in social attitudes and helps for social integration of the persons with disabilities. Association Autism – Sofia is established in 2003 of the parents of the children and young people with disabilities as nongovernmental and non-profit organization. It’s main goal is to protect social and civil rights of the children and the young people with problems in autistic spectra and their families and also it works to support social integration and personal realization. block 50, Ant. D, 101 app, 3 fl. Association “Equality” – Teteven is a nongovernmental organization which unites parents, relatives and friends of the persons with intellectual and physical disabilities in the area of the town of Teteven. It represents their interests and protects their rights. It cooperates to assure quality services for the children with physical and intellectual disabilities on the local level. It works for positive attitudes and tolerance of the society to the persons with intellectual and physical disabilities. q. Zapad, block 54, 12 fl., 67 app. •Center for Social Rehabilitation and Integration of Children and Adults with Disabilities. The efforts of all of us – parents and specialists – are directed to help each person with disability to live together with their parents or in a foster family and to receive love, care and attention within family environment! •Increasing the capacity of all parents by organizing trainings as per different projects – consultations, seminars and discussions. Support provided by a psychologist, social worker, speech therapist, therapist, specialized pedagogues, physician and others. 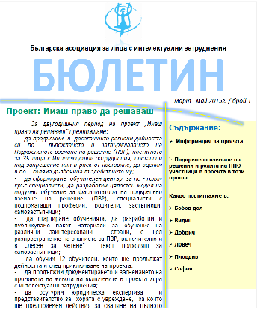 •Exchange of experience with branches of the Bulgarian Association for Persons with Intellectual Disabilities. Partnership with good European practices – Lebenshilfe, Germany. •Access to information in easily accessible format. Accessible forms of communication and online information. Accessible architecture environment. •Our priorities – effective social services and dignified life for the people with disabilities. 69 G. S. Rakovski Str.